With passing time, gemstones have established themselves as a very valuable remedy of Vedic astrology by producing quick and lasting results for many natives who have worn various gemstones. Millions of people have benefitted by wearing different gemstones which suited them according to their horoscopes, acting on advice of their astrologers. For this reason, the trend of asking for suitable gemstones from astrologers has caught up during the recent years. As the awareness about the use of gemstones has increased among people and as more and more people have started wearing gemstones, some problems have also appeared. Many people have witnessed negative effects and losses on various fronts of their lives after wearing certain gemstones which were said to be suitable for them according to their astrologers but which turned out to be harmful or very harmful for them in actual practice. Due to this reason, many people have started doubting the suitability of gemstones and the natives who have suffered due to wearing wrong gemstones have particularly become very reluctant to try some other gemstones as they fear that the other gemstones may also do the same kind of bad things to them, which were caused by the previous gemstones worn by them. However, it should be noted that though their sufferings may certainly have been caused by gemstones; the culprits are not the gemstones but the people who suggested these natives to wear unsuitable gemstones. I mean you shouldn’t blame a medicine for doing bad things to your body and you should have your complaints with the doctor who prescribed such wrong medicine for you. For example, if you are allergic to increased quantities of iron in your blood and your doctor prescribes you a medicine for some health issue where such medicine has iron in it; you’re very likely to suffer from allergies due to increased quantity of iron in your blood. However, it should be noted that the medicine is not at fault here and the doctor who has prescribed this medicine for you is at fault as he gave you a medicine which contained iron. Though you should stop taking this medicine and you also have the right to have your complaints against your doctor, it is not wise to decide that you won’t take any medicine in future as a medicine has caused problems. This is because the same medicine containing iron may do wonderful things for a native suffering from iron deficiency and hence there is nothing wrong with the medicine. It is a simple fact to understand that this medicine is not suitable for you though it may be suitable for many other people. Hence instead of rejecting the concept of medicine on the whole, you should try and find the medicine which is suitable for you and which is capable of treating the health issue you’re currently suffering from. Same is the case with many other things and likewise, same is the case with the application of gemstones. Each and every gemstone associated with navagraha is beneficial for some people whereas it is harmful for some other people and it is the duty of the astrologer to find out whether it is beneficial for you or harmful for you. Though it may look like an easy job to find the right gemstones for you; it may not be so in many cases and the astrologer analyzing your horoscope may get confused when it comes to find such suitable gemstones. This is because the most important factor for recommending a gemstone for you is that the planet related to that gemstone should be working positively for you; and the most difficult job in astrology is to find the working nature of a planet in your horoscope. You may not know the importance of this factor but let me tell you that more than half the job of an astrologer is done; once he is able to establish the working nature of each and every planet in your horoscope. On the other hand, an astrologer may never be able to deliver correct predictions and effective remedies, if he is not able to establish the working nature of all the planets in your horoscope. Hence the working nature of all planets among navagraha is the most important factor in astrology, though there are some other important factors also. However, it is not an easy task to be accomplished by an astrologer and it is a very difficult job to do; if not the most difficult job. This is because the working nature of each planet among navagraha is affected by a number of factors in your horoscope and an astrologer should be able to calculate all these factors properly, in order to reach this conclusion. Whereas some of these factors may become very difficult to calculate at times, some of them are not even known to a number of astrologers. For instance, some factors which are the most important ones when it comes to decide the working nature of a planet among navagraha are this planet’s house of placement, sign of placement, nakshatra of placement, lordship of houses, combination with other planets, placement in divisional charts and the overall tone of the horoscope. Though these factors may look simple to read, they are very difficult to master as each one of these factors involves a complex mechanism and hence it is a job in its own. The most difficult thing however is that when it comes to decide the working nature of a planet; some of these factors may bend such planet towards positivity and some of them may bend it towards negativity. This is where this calculation may become complex and tricky as the astrologer may not be able to find the resultant of these complex and contradicting influences on a planet. Each and every part of all important factors is responsible for a percentage of positive or negative nature of a planet in question. It means if the factors in favor of a planet render positivity to it in a way that the collective positivity of these factors becomes 80% and the factors against this planet render negativity to it in a way that the collective negativity of these factors becomes 20%; the planet is broadly positive. This is because its working is 80% positive and hence it is likely to produce good results for the native; though it may introduce some side effects also; due to the partial negativity it has. On the other hand, if the factors in favor of a planet render a collective positivity of 20% and the factors against this planet render a collective negativity of 80% to this planet, the planet is broadly negative. Such planet may trouble this native in many spheres of his life though it may give him some small benefits also from time to time; due to the partial positive working. The same calculations need to be done for each planet among navagraha and the results may be confusing at times. It means though a planet may look broadly positive, it may not be the case as the astrologer may have ignored or miscalculated the negative impact of a major factor on this planet. As a result, the astrologer may consider it to be 90% positive whereas the planet in reality may be 60% positive and 40% negative. Though the planet is still having majority of its percentage as positive; a gemstone should not be recommended for this planet. This is because 40% is a significant percentage and hence the negative part of this planet’s energy may cause significant problems for the native; once it gains strength through the gemstone of this planet. In this situation, a simple miscalculation of the astrologer may make him recommend this gemstone to his client and the client may suffer. However, since the planet still has a majority of its energy as positive energy; the sufferings may be significant but not of the extreme type. On the other hand, if the astrologer ignores or miscalculates many of the important factors influencing the working nature of a planet in a horoscope, the results may be disastrous. In such a case, the astrologer may think the planet is having positivity in excess of 80%; it may have negativity in excess of 80% in reality. This is the case where the astrologer may recommend the gemstone for this planet and such gemstone may produce disastrous results for this native, depending on the running time as well as depending on the field of impact of this planet in his horoscope. For example, if this planet is having its primary impact on the profession of this native and the running time is also negative; the native may face big financial losses, disputes, court cases, bad reputation and even imprisonment through his profession; after wearing this gemstone. Similarly, if this negative planet affects the marriage of the native and the running time is also negative; the native may face serious problems in his marriage or even a broken marriage; after wearing this gemstone. Hence all the important factors which influence the working nature of a planet in a horoscope should be analyzed properly in order to determine the net positive and negative nature of that planet; so that the possibility of recommending or not recommending a gemstone for that planet may be found out. However as this is a very complex procedure; many astrologers avoid it and they depend on some simple and easy to calculate factors while deciding the working nature of a planet in a horoscope. For example, many astrologers only pay attention to the house of placement and sign of placement of a planet though some of them also pay attention to lordship of this planet over different houses of such horoscope. Many of these astrologers may not pay due attention to the influence of nakshatras and planetary interactions whereas most of them may not pay attention to the overall theme of the horoscope; which in reality is the most important factor among all such factors. The overall theme of a horoscope is so important that it can change each and everything. For example, if the overall theme of a horoscope is negative and it bends the native towards a life of crime; the last thing you want is a strong and active Mars placed in the sign of Aries in this horoscope, even if such Mars is positive. This is because the overall theme of this horoscope may exploit the strong and positive energy of Mars for negative purposes. Since Mars is a planet of physical strength, courage and bravery among many other things, the overall negative theme of this horoscope may misuse these qualities rendered by strong and positive Mars. As a result, the native may engage in crimes of even higher quantum as such Mars may provide him with more physical strength and bravery which he may misuse for selfish purposes. Hence Mars may turn out to be a negative planet in this horoscope in reality though it may look like a positive planet in theory. Therefore, the last thing an astrologer should do is recommend a Red Coral to the native having this horoscope as doing so may produce disastrous results. Mars may gain additional strength once this native wears a Red Coral and such additional strength may boost the aspects like bravery and courage. As a result; the native may start engaging in even more violent types of crimes as he has more courage and bravery now. Hence a gemstone for Mars should not be recommended in this case. Looking at the correct approach for this native; the astrologer should find out if any one of the planets Jupiter; Saturn or Sun is working positively for this native. For example, if Jupiter is positive in his horoscope, a gemstone for Jupiter should be prescribed. As this native wears this gemstone, he may start having more and more moral sense of right and wrong since Jupiter is directly associated with moral sense of right and wrong. As this sense becomes stronger due to this gemstone, the native may now find it difficult to engage in crimes as an increasing part of his personality may start opposing such actions now. Similarly, wearing the gemstone for positive Saturn may bless this native with more patience and a calculative approach which may do the same job, though in a different way. Whereas the additional strength gained by benefic Jupiter may motivate this native to stay away from crimes on moral grounds; the additional strength gained by benefic Saturn may motivate this native to stay away from crimes on legal and practical grounds. It means that this native may now start thinking more and more about the advantages and disadvantages of engaging in crimes; over a longer period of time. He may eventually find out that such life of crime may cost him dear in the end and he may slowly but surely walk out of it. Though the native may disengage from crimes on moral grounds after wearing the gemstone for Jupiter and he may do the same on practical and legal grounds after wearing the gemstone for Saturn; the result is the same in both the cases and this is what matters the most. Similarly, this native may choose to disengage from crimes after wearing a gemstone for positive Sun as he may now become more and more concerned about his general image in public and he may develop a strong tendency to avoid defame; which is among the first things you may come across when you engage in crimes. Hence the native in this case may also walk out of a life of crime, though the grounds may be different in this case also. You see, depending on the overall tone of a horoscope, how even the gemstone for a positive planet can be harmful? Hence each and every aspect should be considered carefully before deciding the overall working nature of a planet in a horoscope and before prescribing the gemstone for such planet. It should be noted that in the recent example; Jupiter, Saturn or Sun may only help this native get out of a life of crime if they are positive in the horoscope of the native in question. On the contrary, negative Jupiter, Saturn or Sun may enhance the tendency of this native to engage in more and more crimes. This is because negative Jupiter may distort the moral reasoning of this native and he may not have a proper sense of moral responsibility. For instance, if this native engages in prostitution racket under the effect of an overall negative horoscope, he may think that he is doing a favor to the women by giving them work as otherwise, they may not be able to manage their lives in a good way. In this case, the gemstone of Jupiter may only strengthen this belief and hence it is not likely to help him. On the contrary, this gemstone may aggravate the problems as his distorted moral reasoning may become even more distorted, resulting in his engagement in more and more crimes. Similarly, negative Saturn may distort the practical and legal reasoning of this native and he may now think that some laws have been made by fools and there is no harm in breaking them. For instance in the same situation, this native engaging in prostitution racket under the influence of negative Saturn may think that the government has no right to form laws against prostitution. He may think that if a woman is willing to offer sexual services, someone else is willing to pay for those services and he is working as a mediator; the government has no right to step in and stop them from doing so as this is their personal affair and not the affair of the government. In this case, the gemstone for Saturn may further strengthen this belief and he may start engaging in more and more crimes; instead of reducing the number of crimes committed by him. Similarly in case of negative Sun; this native’s sense of an overall image may become distorted. Hence he may be of the view that whether good or bad; name is name. It means he may enjoy the fact that he is well known for the crimes committed by him and he may take great pride in becoming a notorious criminal. This native may engage in crimes; primarily in order to make a name for him in the crime world. As you understand; the gemstone for Sun in this case may increase this tendency and hence the native may engage in crimes of even bigger quantum; in order to become more and more known as a criminal. You see, how complicated can it be to establish the overall theme of a horoscope, to establish the working nature of a planet based on that theme and to recommend gemstones for positive planets in that horoscope? This is why some astrologers may make mistakes while recommending gemstones for you and you may have to suffer because of such gemstones. However, it should be noted that if you’re able to find a good astrologer; he may recommend the right gemstones for you and those gemstones may do wonderful things for you. Hence the focus should be on finding a good astrologer and not on staying away from gemstones and other astrological remedies as choosing to do the latter certainly reduces your chances of achieving much more in your life. Gemstones are gaining more and more popularity among people as astrological remedies and accordingly, more and more people are wearing gemstones in order to benefit from them as this fact has now been accepted by most people wearing gemstones that gemstones are among the fastest working remedies of astrology. As the concept of wearing gemstones in order to get benefits is catching up, many questions regarding how to wear these gemstones, how to identify these gemstones, how to maintain them and other such kinds of questions related to the gemstones are raising their heads every now and then. Accordingly different astrologers and gemstone specialists are giving different opinions on these questions related to the use of gemstones, which can sometimes make the situation complicated. It is said by many astrologers that the gemstones for navagraha will show effect only if they have been properly purified and energized and wearing gemstones without purifying and energizing them does not give any benefits related to these gemstones. On the other hand, wearing them without these procedures can cause harmful effects and hence all the gemstones assigned to navagraha should always be purified and energized. As the process of purification and energizing gemstones is very technical and it is available only with few expert Vedic Pandits, it is very difficult for everyone to get their gemstones purified and energized as finding such expert pandits can be a really tough job. In this chapter, we are going to discuss whether the gemstones must be purified and energized before wearing them and we will also discuss the actual process of purification and energizing gemstones. To start with the topic, let’s first look into the need for purifying and energizing the gemstones assigned to navagraha. Most gemstones pass through many hands before they reach us for wearing and accordingly, all the people touching these gemstones mark their impressions on these gemstones which means that the aura of all these people is marked on these gemstones. It means that these auras whether good or bad, they accompany these gemstones and as a result, we get the gemstones surrounded by certain auras which can be very positive or which can be very negative and which is altogether unknown to us. It should be noted that even though the aura of everyone touching the gemstones is registered with these gemstones but generally the aura of people touching these gemstones for a short duration of time is not capable of leaving strong and long lasting imprints or impressions on these gemstones. Hence the impressions of such auras on gemstones is not a cause of concern in most cases as most of the people touching these gemstones touch them for short duration of time like a few minutes and hence a strong imprint of their aura is not marked on these gemstones. The problem however arises when a gemstone has been touched by someone for a long or a very long period of time like for few months or even more, as in this case the impression of aura of such person touching this gemstone is strong or very strong and this is what can cause problems if this aura is negative. This can happen if the gemstone purchased by you has already been worn by someone for a few days, weeks or months as in this case the gemstone continuously keeps touching the skin of such person and accordingly a strong impression of aura of this person is marked on the gemstone, which can take many days or even many months to completely fade away. When we wear a gemstone which has already been worn by someone for some days or some months, the aura of the person who had worn this gemstone, also comes to us with this gemstone and this aura casts its influence on us along with the gemstone. If this aura is negative and strong, it can certainly cause malefic effects or some problems which are not due to the gemstone but which are due to the negative effect of the aura surrounding this gemstone. It should be noted that a gemstone will still work and transmit the energy of its corresponding planet even if it is carrying a strong negative aura of the previous wearer, but in this case the native wearing such a gemstone will be receiving a mixture of the energy of the gemstone and the energy of the aura surrounding this gemstone and this is where the process of purification comes handy. The process of purification of gemstones is the process through which all weak or strong impressions of negative auras marked on the gemstones are removed with the help of certain mantras and certain other technical processes which are known to and executed by expert Vedic pundits. As a result, these gemstones become free from any possible negative energy caused due to some negative aura surrounding these gemstones. When a native wears such a purified gemstone, he is influenced by the energy of the gemstone and its corresponding planet only and he is not influenced by any other kind of negative energy which may be surrounding the gemstone and this is why the process of purification of gemstones is considered important. It should be noted that the aura of most of the people touching the gemstones for a short duration of time is generally not capable of marking strong impressions on these gemstones and accordingly, such touches can’t cause any significant negative effects and such auras usually fade away within a few days after these gemstones are worn by someone else, as their own aura supersedes such weak auras. However if a gemstone has already been worn by someone prior to you, for a long period of time, the aura impressions marked on this gemstones are much stronger in this case and it can take them a few weeks or even a few months to fade away completely and such aura impressions can keep casting negative influence on you until they fade away completely. Coming to the process of energizing the gemstones, the process of energizing the gemstones is the process which is carried out in order to charge the gemstones with the energy of their corresponding planets among navagraha with the help of Mantras, poojas and some other processes. As a result, the gemstones can provide better benefits to the native wearing them as energized gemstones are capable of establishing a stronger connection with their corresponding planets due to the effects of energization. It is important to keep in mind that all the gemstones which have not been energized, are still capable of capturing and transmitting the energy radiations of their corresponding planets into the body of the natives wearing these gemstones, provided such gemstones possess a proper quality and efficiency, though the energized gemstones are capable of establishing a stronger connection with their corresponding planets and accordingly they can provide better results to the native. Hence the process of energizing the gemstones should not be taken as a compulsory step and it should be considered as a process which can enhance the performance of your gemstones. To Summarize, the purification process of gemstones is required in the cases where the gemstones have been already worn by someone else and if you are sure that the gemstones purchased by you have not been worn by anyone else before you, the purification process for such gemstones is not a must do in most of such cases. On the other hand, if the gemstones purchased by you have already been worn by someone else before you, the purification of these gemstones is something that you must consider in this case as wearing such gemstones without proper purification can cause some initial negative effects which can last for a few weeks or for a few months. These negative effects are not caused by your gemstones but they are caused by the negative aura or auras surrounding these gemstones. Regarding the process of energizing gemstones, this is not a compulsory or must do process and this is an optional step through which you can enhance the performance of your gemstones. Hence you can choose whether or not you want to get your gemstones energized and even if you choose to wear your gemstones without getting them energized, they will still produce results. Many people are wearing gemstones nowadays and most of them are very much concerned when it comes to their quality, genuineness and how to wear them but only a few people know or care that the gemstones need maintenance in order to keep giving their optimum results. Most people usually put gemstones once on their fingers or in a pendent and then forget about them altogether whereas they should make it a routine to take care of their gemstones on regular basis otherwise the gemstones they are wearing may not be able to perform optimally after a certain period of time. Accordingly the benefits associated with these gemstones may start reducing in numbers and quantum with the passage of time. So let’s look at few things we can do to get the most out of our gemstones for a longer period of time and let’s also know how to increase the lifespan of certain gemstones by keep certain things in mind. Gemstones are basically of two types when it comes to durability or their lifespan. Ruby, Sapphires, Emerald, Hessonite and Cat’s Eye fall under the first category which has a very long lifespan whereas Pearl and Red Coral fall under the second category which has shorter lifespan and so they need to be replaced after some years depending on their quality. Starting with the first group which is a transparent group also, as we wear these gemstones and we start using them, layers of greasy material start depositing on their surfaces due to combined action of some oils, lubricants, greasy materials, dust and some other things that we come in contact with, every now and then. Whereas most of us are very much aware of the formation of such deposits when it comes to the upper surface of the gemstones we wear, only a few of us ever bother to look at the lower surface of the gemstones and see what is happening there. The lower surface is the surface of the gemstones which touches your finger and is usually hidden from any eye contact. So the greasy deposits or layers of impurities start forming on this surface and we do not notice them as they are not visible to us most of the time unlike the deposits formed on the upper surface which we notice very soon and take care of them. Such deposits of impurities start getting thicker and thicker with the passage of time and a time comes, when they start blocking the path of energy radiations that a gemstone receives from its corresponding planet. The rays are unable to pass through these impurities and hence they do not enter our body, which is the sole purpose of wearing gemstones. As these deposits become thicker and thicker, a point comes when the major percentage of a gemstone is blocked by these impurities and it virtually stops working anymore. So we need to take care of the gemstones we wear on regular basis in order to make sure that no deposits form on the outer as well as inner surfaces of these gemstones. A simple test for checking it will be to remove the ring and then hold it in front of your eyes when there is bright light in the background. This way you’ll be able to see even the slightest of the deposits that may form on the surfaces of the gemstones. If you detect any such deposits, the next thing to do is to get rid of them. The easiest and the most effective way to do that is to take a clean toothbrush and clean the surfaces of the gemstones by rubbing them with the brush while putting the gemstone under running water at the same time. In a matter of seconds, you’ll see that the deposits are gone and the gemstones are back to their original selves again. However, if the deposits are sticky and they don’t go away by simple action of brush and water, you can use some liquid soap or liquid detergent in small quantity to get rid of these deposits and get the gemstones back to their original shine and transparency. Repeating this process once a month is generally sufficient in most cases unless you are into something which involves dealing with greasy materials more than usual in which case you may need to repeat the above mentioned process every couple of weeks to make sure that your gemstones are in good condition to perform. If the deposits are very sticky and you are not able to get rid of them even after brushing them under water or by using detergents, here is what you can do to get rid of them. Take warm water in a mug, put some hair shampoo in it and mix it. Put your rings or pendants in it for about 20-40 minutes and then get them out. Wipe them now with a cloth or brush and wash them with warm water afterwards. Your gemstones will be clean now. Moving on to the next group of gemstones also known as the Opaque group, the kind of care you need to take in their case is very much different from the first group of gemstones. Pearl and Red Coral are not hard gemstones and they erode away with the action of Water, Detergents, Sweat and certain other things. So the first thing you need to do is to keep them away from water and especially detergents as the action of detergents can decrease the lifespan of these gemstones considerably. So if you’re wearing any of these two gemstones, make sure that you remove them before you wash your hands or do something that involves the action of fluids and detergents. Formation of greasy deposits is not a big issue in this case as the outermost surfaces of these gemstones continuously keep vanishing and so the deposits also go away with them. But if you still find some deposits on these gemstones, the best way to remove them is by using a piece of wet cloth or a wet brush and wipe the deposits. If the deposits are greasy, use as little detergent or soap as you can and get rid of the deposits though not much is actually required to do in case of these gemstones as they keep eroding and new and fresh skin continuously keeps appearing. So what you need to do in case of these gemstones is to keep them away from the action of excessive fluids and detergents. Doing this will prolong their lifespan and you will need to replace them less often. These are few simple but very effective methods that you should use for proper maintenance of the gemstones that you are wearing. Doing the things mentioned in this chapter will ensure that your gemstones keep working to their optimum potentials and they have the longest possible lifespan. Many of my clients and readers ask me about the importance of quality of the gemstones they have been recommended to wear as well as the weights of these gemstones recommended for them. Gemstones are one of the most effective remedies offered by Vedic astrology and they are capable of bringing very strong and fast results. In some cases, the native wearing these gemstones can see visible changes in a matter of hours and days and this is the reason for which the use of gemstones as astrological remedies has increased over the past few years and more and more astrologers are now suggesting gemstones to their clients. But knowing and wearing the suitable gemstones alone is not sufficient in most cases and the knowledge of proper suitable weights for these gemstones is also necessary as the suitable weights can vary from person to person depending on his horoscope. The quality of the gemstones plays a very important role when it comes to getting results from the gemstones as the gemstones with poor quality are not capable of producing the significant benefic effects in most cases. Hence due attention should be paid to the quality of the gemstones which are to be worn by a native who wishes to benefit by wearing these gemstones. Discussing a few things about the weights of the gemstones as recommended by the astrologers versus the weights which are worn according to the discretion of the native or the gemstone vendor, it should be noted that the appropriate weight of a suitable gemstone is a very important criterion and it should not be ignored or overlooked. I have seen some clients not benefitting from their gemstones merely due to the fact that they chose to wear far less weights for their gemstones compared to the weights which were recommended to them by me or by other astrologers. On the other hand, I have seen some people facing problems or even troubles only due to the fact that they had worn much heavier gemstones than they were recommended to wear. Gemstones are very much like medicines and we know that knowing the right medicine for a problem alone is not sufficient and we must also know the right time to take the medicine as well as the right dose and frequency of such medicine. For example, if a medicine like an injection of insulin has been prescribed to someone suffering from high blood sugar, knowing the insulin alone will not help this patient and he must know how many units of insulin should be injected and how many times a day. If 10 units of insulin have been prescribed and three times a day is the frequency of these injections, then tempering with any of these two parameters can significantly change the results. For example, if the patient chooses to take 2 units of insulin with same frequency or he chooses to inject 10 units just once a day instead of doing it thrice a day, in both the cases, he is not likely to benefit much from the medicine as he is not taking it properly. On the other hand, if the patient decides to inject 20 or 30 units of insulin in a single go, this can cause problems for the native and instead of benefiting from the medicine, he may have to face more problems as injecting much more insulin than is required can cause his blood sugar levels to drop sharply which can cause problems. Similarly, when some natives choose to wear gemstones much heavier than the ones recommended to them, the gemstones can start causing some side effects or problems for the native instead of giving benefits. To understand this concept better, it should be noted that many benefic planets are placed in such combinations in most horoscopes, that they can produce better results when a certain amount of extra energy is provided to these planets through their corresponding gemstones. But if these positive planets are supplied with much more energy than is required by wearing much heavier gemstones, the same positive planets can start dominating the horoscope as well as the body and aura of the native wearing these gemstones and these extra strong planets then start interfering with the significances of some other planets in the horoscope which can vary from horoscope to horoscope. Taking Vitamin or mineral supplements to fulfill a deficiency or to provide extra edge to the body is good but taking too much of the same vitamins or minerals will simply start causing problems and it is the same with everything else and gemstones too. Proper weight of a gemstone will provide the required strength to a benefic planet which is weak on one account or the other whereas a much heavier weight for the same gemstone can start causing problems for the native. Hence the weights of the gemstones should always be chosen according to the recommendation of your astrologer as he is the one who knows what weights are suitable for each one of the suitable gemstones. Coming to the quality part of the gemstones, many natives buying their gemstones are presented with gemstones of very low price ranges and accordingly, of very low quality and some of these natives are tempted to buy cheaper gemstones in order to save money while thinking that such cheap gemstones will also produce the same effects as costly gemstones can. It should however be noted that the gemstones must possess a certain minimum efficiency to produce significant results and this is where the quality of the gemstones comes in picture. The gemstones typically absorb the energy of their corresponding planets through their upper surfaces and then they transmit this energy into the body of the native wearing these gemstones, through their lower surfaces. For example, a Ruby will typically attract the energy of Sun from its upper surface and it will then transfer this energy into the body of the native wearing this gemstone, through its lower surface. During this process, the energy radiations of the planets travel from the upper surface of these gemstones to the lower surface of these gemstones and this is where the quality of the gemstones plays important role. Gemstones can contain impurities which can be in many forms including linings, dots and clouds where clouds can form the worst kind of impurities and all these impurities block some parts of these gemstones. It means that when energy radiations enter these gemstones through the upper surfaces and they travel towards the lower surfaces of these gemstones, the impurities present inside these gemstones block the path of these energy radiations and they do not allow the energy radiations to pass through them. Hence these energy radiations can’t travel to the lower surfaces of the gemstones from where they are transmitted into the body of the native wearing these gemstones. Hence the more impurities a gemstone has, the more energy radiations are blocked and the less effective is the gemstone and this is how the efficiency of a gemstone is measured. In my research and analysis with gemstones, I have observed that a gemstone should possess at least 40% efficiency in order to produce significant results for the native wearing such gemstone. It means that for a Yellow Sapphire to be 40% efficient, it should transmit at least 40 energy radiations of Jupiter into the body of the native wearing this gemstone, if 100 energy radiations are captured by the upper surface of this Yellow Sapphire. Similarly, a yellow sapphire which transfers 60 energy radiations out of 100 energy radiations that fall on its upper surface is said to have an efficiency of 60% and this efficiency goes on increasing as the number of energy radiations transferred out of 100 captured radiations keeps increasing. The gemstones with excellent quality can have as high efficiency as 95% or even more, which means that they are capable of transferring all the energy of a planet, captured through their upper surface. 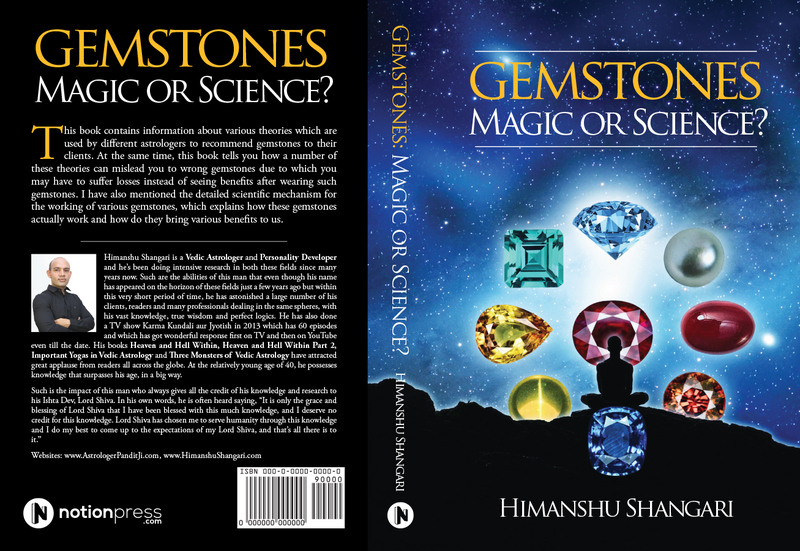 Apart from transferring a higher percentage of energy into the body of the wearer, the gemstones with higher qualities are capable of transmitting some energy radiations of their corresponding planets, which belong to a slightly different but finer wavelength, which can bring better results with fewer side effects whereas the gemstones with lower quality are not able to capture these energy wavelengths and hence they can’t transfer them. Hence due attention should be paid to the quality of the gemstones that you are buying and gemstones below a certain quality should never be purchased as they can prove worthless in the end. It may be a good idea when you are trying to save money by purchasing a reasonably priced Yellow Sapphire with 50% efficiency compared to a very expensive Yellow Sapphire with 80% efficiency but it is always a bad idea to save more and choose a Yellow Sapphire with 10% efficiency just in order to save more money. In the previous chapter named Mechanism of Gemstones, we have discussed the mechanism involved behind the working of gemstones and we have seen that a gemstone transmits the energy of a particular planet into your body, and that particular planet gains strength by means of this extra energy. If that planet is a good planet for you, it will not only start giving its positive results more quickly and with more quantum but it will also become stronger to face the bad aspects or effects of bad planets. It means that such a positive planet will be in a better position to deal with the afflictions given to it by negative planets either by virtue of conjunction or by virtue of aspect. Moving on, we will now look into some magical aspects involved behind the working of the gemstones, on scientific basis. What I mean to say is that I will try to cast some light on the mechanism through which the gemstones are able to do magic for you once they start transmitting energy of a particular planet into your body. To understand this concept better, let’s try to understand the concept of Aura that every person as well as every other entity in this world has around it, in the form of an invisible pattern of energy. From ancient times, Indian spiritual philosophy has been asserting that there is an Aura around every person and in the recent years, many scientists have claimed to prove this theory as they have been able to take pictures of the Aura around many people. This Aura consists of electromagnetic radiations including Microwaves, Infrared and Ultraviolet radiations and most of the good as well as bad things are happening to us due to the effects of this Aura around us. This Aura is unique for everyone depending on the good deeds and bad deeds done by them in their past and present lives according to the spiritual philosophy. It means that the Aura of a person is nothing but the sum total of positive and negative energy patterns gained by that person through his good and bad karmas. To learn about this concept in details, kindly read my book ‘Heaven and Hell Within’. Scientifically, this Aura is formed by the energy radiations of particular strengths and particular natures belonging to particular planets, which may be good as well as bad planets for the person whose Aura is being studied. As soon as a person is born at some place on the earth, the Constellations, the Signs as well as the planets register their positive or negative energies with different energy centers present inside the body of that person. As these energy centers then start emitting the energy or combination of energies registered with them and stored in them, an Aura is formed around that person, which stays with him for the rest of his life. This Aura keeps changing more or less, depending on different time periods in the life of that person, good or bad karmas done by that person as such good or bad karmas keep adding more good or bad energy which means more positive or negative energy to the Aura of that person, and depending on some other important factors. All these factors have been discussed in details, in my book ‘Heaven and Hell Within’ and interested readers should read this book to know more about this topic. As the formation of this Aura around us has been explained, let’s try to find out, how this Aura works and how it brings all the good as well as bad things to us. To understand this concept in an easier manner, let me once again take the help of an established scientific concept. This time, we are going to look at the formation of volcanic rocks which will help us understand the concept of how this Aura around every person works. When a volcano erupts and the lava flows out of it, it gradually starts cooling down due to the atmospheric conditions like temperature etc. and it proceeds towards the formation of volcanic rocks. As this lava cools down and goes through the process of changing into rocks, it witnesses some important things going around it at that time, as this lava contains some magnetic minerals which are capable of recording the magnetic properties present in the atmosphere at that time. In simple language, this lava records the orientation and strength of earth’s magnetic field as it settles down to form a volcanic rock and the impressions recorded on it remain within it as a signature for the rest of its life. Layers and layers of lava keep erupting from volcanoes and they keep depositing fresh layers of volcanic rocks on the already formed rocks. It should be noted that each and every layer of the volcanic rock formed through such process, records the orientation and strength of the earth’s magnetic field present at that time. Various scientists have been studying these signatures present inside different layers of some ancient volcanic rocks for various purposes. Some of these rocks are as old as the volcanic rocks found on the north shore of Lake Superior in North America which date back to 1 billion years. From these signatures, they’ve been able to predict the strength and orientation of earth’s magnetic field at different times in the past. Doesn’t it seem amazing that the signatures recorded at the birth of a volcanic rock remain intact within that rock even after 1 billion years? Well as surprising as it may be, it is an established fact now. Leaving the volcanic rocks and getting back to astrology, similar concept is involved in the formation and working of the Auras around people. The Aura once formed around a person keeps its signatures intact and then different layers of changes in planetary radiations are deposited on the already formed layers and the process goes on. As the scientists can dig out the older layers and interpret the signatures, in the same way it is possible to read the different layers of an Aura around a person and tell him about the things that happened to him in this life and also tell him about the things he did or the things that happened to him in his past lives going back to as many of his past lives as many were there. But only a very advanced spiritual person is able to do this and the scope of astrology is not this vast as astrology takes a different approach. When a person is born, the resultants of his good or bad karmas are recorded in the form of an Aura which according to astrology is the outward expression of the combined impact of good and bad planets which have registered their negative or positive energies at the time of birth of that person. This is called the net energy equation of that person, the horoscope of that person or the Aura at the time of birth of that person. The same impressions can be drawn in the form of a horoscope knowing the birth details of a person and through such horoscope, the impact of good and bad planets at the time of birth of that person can be known. Starting from there, the coming good times or bad times in the life of a person can be predicted as they are nothing but the resultants of the good or bad impressions of different constellations, signs and planets recorded at the time of birth of a person, the planetary periods and sub periods and the transit impacts of planets in different signs at different times. All these impressions are made on the basis of good as well as bad karmas done by the person in question, during his past lives. Doesn’t this all sound very complicated. Well it is complicated, and that is why the predictions made even by an expert astrologer may not always come true, as there are so many permutations and combinations going on and some of them may not be interpreted correctly or some of them may be missed altogether. So there is always a chance of error or exception in astrology like in any other field, though most of the time, an expert astrologer is able to predict the things that happened in the past and the things that are likely to happen in the future, after analyzing such impressions of various positive as well as negative energies, from the horoscope of a native. Getting back to how the Auras around us work, every person continuously receives and emits energy radiations which are the characteristic radiations of different planets. In case of a bad planet, the radiations absorbed and emitted are bad so the results will also be bad. For example, let’s assume that Mars is behaving negatively in someone’s horoscope and it is giving its bad results particularly regarding the marriage of the native in question, where such bad results may include a delayed marriage or disturbed marriage. In this case, every time a marriage proposal is considered for that person, the bad influence of Mars which is constantly being emitted in the form of radiations will affect the second party adversely and most likely the second party will back out not knowing about what influence actually made them reject the proposal. Even when the marriage of this person takes place eventually under the impact of some very good planets, the bad influence of Mars will continue and it will provide either of the partners with one or the other reason to quarrel with each other. This process goes on until some outer forces are applied to weaken the impact of bad influence radiated by Mars for that person. These outer forces are called astrological remedies. In the same way, disturbance in love affairs, legal disputes, fame and defame can be explained. Going deep into the details of this concept, the negative or positive effects of the Aura present around a person puts its signatures on the things touched by that persons, the people known and met by him, and the things or people with whom he interacted through any such means which support energy transfer from this person to those things or people. For example, if Mercury is the planet that rules the house of government in the horoscope of a particular person, it will affect him positively or negatively depending on the good or bad, weak or strong effect of Mercury registered at the time of birth of that person and some other factors like planetary periods and transits. If Mercury is benefic for this person, as he fills the documents, say an application form for some contract with some government department, he will be influenced by Mercury to fill up a very suitable application form, and then the good impact and the strength of Mercury is registered with those papers also. This impact will influence the concerned authority positively with the strength of the impact registered, as and when the concerned authority goes through those papers. So in case some other application belonging to some other person having the good impact of a planet on his papers and which is stronger than the impact registered on the papers of the first person is not received, the authority will be convinced by Mercury to assign this contract to the first person and the person will get that contract. On the other hand, if Mercury is working negatively for this person, the same Mercury will influence the authority adversely and his application form will most likely be rejected. I know it seems hard to believe that the impact of a planet can be registered on a paper, but that’s how it is. After all if an impact can be recorded on a volcanic rock and it can survive for a billion years, why can’t an impact registered on some other thing like a paper survive? Yes, it can surely survive and it does survive for a very long period of time. This is the reason why people having religious and spiritual knowledge tend to visit the holy places more and more as they know that the impacts of long lasted presences of some very powerful saints or some very good deeds were recorded there, which are still capable of influencing everyone who visits those places, in a strongly positive way. That is why the places where an incarnation of the God Almighty or some powerful saint used to stay or meditate or preach are considered most sacred as very powerful signatures of highly positive energy represented by these spiritual powers have been registered there. This energy is highly positive and it has such a great strength that it can easily last for thousands of years and so the people visiting these places can benefit from this highly positive energy by absorbing some of this energy. This concept of transfer of energy through people and places has been explained in my book ‘Heaven and Hell Within’ and interested readers should read this book. Getting back to the Aura once again, if a planet is good in nature for a person but weak in strength, it will radiate positive energies with weak strengths which simply means that it will lead to the start of some good things which are not likely to be accomplished as the planet as well as the radiations emitted by the planet are weak and they can’t get the person through, though they can get him started. So in this case, the native in question initiates efforts to achieve good things at different times of his life but most of these efforts do not click for him as the planet ruling those fields is weak and not able to give its proper results. This is where the gemstones come handy. A gemstone for that particular planet with a particular weight suitable for that person is prescribed to be worn and as the gemstone is worn by that person, it starts transmitting more energy of that planet into that person, and accordingly the person emits stronger radiations of that planet which is already good for him. As the radiations of this planet emitted by this person gain strength, they start influencing more people in his favor and they start getting more benefits for him. The gemstones work in each and every way possible to give results to the person wearing them. When a person starts wearing gemstone for a positive planet, at first he starts undergoing many physical and psychological changes within him and due to these changes he keeps getting physically more capable and fit, and mentally more stable and sound to take comparatively better decisions and then execute them more properly. As this starts happening, this person improves in quality and as a result, the efforts put in by him in various spheres of his life increase in quality due to which he starts seeing better results in those spheres of his life. As this person wears more gemstones for other good planets in his horoscope and as the power of many good planets for this person increases by wearing the gemstones for them, the person starts emitting more and more good radiations with better strength which help him invisibly. So the gemstones have visible as well as invisible effects on a person who wears them. This is how the gemstones work and this is how one can get benefits by wearing the right gemstones with proper weights required. It is however very important to note that the same mechanism works for the gemstones possessed by the planets which are working negatively for a person. It means that as soon as a person starts wearing the gemstones for the planets which are not suitable for him and which are giving him negative effects already, these gemstones will transfer more power to such negative planets and they will start emitting negative radiations more powerfully, thus causing the person more and more harm. So it is strongly advised that you should never wear gemstones on your own and you should first consult someone who knows a great deal about them so that he may recommend the right gemstones for you. I’ve personally witnessed many cases where people have got very bad results by wearing the wrong gemstones. So never wear the gemstones on your own and always consult an expert on the topic to get recommendations. The negative impact of the planets can’t be reduced or controlled by wearing the gemstones for them and it is instead done with the help of specialized astrological remedies like Mantras, Yantras, Poojas and Charities which gradually keep reducing the negativity of those planets by adding more and more specific types of positive energies to your Aura. As the negativity of these planets reduces, you start seeing reliefs first and benefits later on. Astrologers practicing in numerology assign name numbers to every person, which is calculated from their names according to the rules of numerology and which is obtained as a sum total of all the numbers assigned to various alphabets of English. For example, for my name Himanshu Shangari, the name number will be calculated as the sum total of all the numbers assigned to all the consonants and vowels in my name which means 8 for H, 9 for I, 4 for M, 1 for A, 5 for N, 1 for S, 3 for U, 7 for G, and 9 for R.
Adding up the numbers corresponding to alphabets used in my name according to the rules of numerology, we get 8 + 9 + 4 + 1 + 5 + 1 + 8 + 3 + 1 + 8 + 1 + 5 + 7 + 1 + 9 + 9 which comes up as 80 which on further adding up like 8 + 0 comes up as 8. Hence 8 is my name number according to numerology and accordingly the gemstone belonging to the planet which rules number 8 which means the gemstone belonging to Saturn is my lucky gemstone and hence I should wear a Blue Sapphire according to my name and name number. Similarly other gemstones are suggested to other natives by these astrologers practicing in numerology based on the name numbers obtained from their names. It should be noted that such recommendations of gemstones based on name numbers have nothing to do with the actual working nature of various planets among navagraha, in the horoscope of the native and in fact, many such astrologers recommending gemstones in this way do not even take a look at the horoscope of the native in the first place. Moving further with this theory of recommending gemstones on the basis of name numbers of various natives, some astrologers or numerologists recommending gemstones on the basis of name numbers believe that success can be achieved by all natives merely by making some changes to their names which results in different name numbers for these natives and accordingly different gemstones can be made suitable for various natives or for each native merely by making some changes in the name of the native. For example, if my name is rewritten as Himaanshu Shangari instead of Himanshu Shangari by adding an extra A to Himanshu, the name number comes up as 9 instead of 8 as the added A stands for 1 in numerology and it will add a total of 1 to my name number. It means that the resultant of my new and modified name will come up as 9 and accordingly, a Red Coral becomes suitable for me now because the number 9 belongs to Mars according to numerology and my name number is now ruled by Mars and hence the gemstone for Mars now becomes suitable for me. Similarly the gemstones belonging to all other planets among navagraha can be made suitable for me merely by making some changes in my name or changing my name in a variety of combinations which will result in different name numbers and accordingly, different gemstones will be suitable for me. Hence I can wear the gemstones belonging to all planets among navagraha by changing my name and all those gemstones are supposed to bring good luck to me according to this theory of recommending gemstones on the basis of names and name numbers, practiced by some astrologers or numerologists. As of now, most of the readers may have concluded by themselves that the above mentioned theory of recommending gemstones on the basis of names and name numbers found through numerology is nothing but a fancy thought which has got nothing to do with reality of life, reality of navagraha, reality of karmic astrology and Vedic astrology in actual practice. The whole concepts looks just like an easy to play game through which all the natives in this world can make gemstones of their choice suitable for them by making some adjustments to their names. Such adjustments change their name numbers according to numerology and such gemstones which were previously unsuitable for these natives are now suitable for them just by virtue of these natives changing their names. The theory of gemstones, navagraha and karma is not as simple as this and at the same time it is not so easy to twist certain things and change your destiny. The working nature of each planet among navagraha is decided by the past life karmas of each native according to Vedic astrology and such working nature of any planet among navagraha can be changed from negative to positive only by doing good karmas and guided astrological remedies belonging to the significances of that planet and not by changing the name. Gemstones work like motors or boosters which bring up the results of your past life karmas with faster speed and gemstones have got nothing to do with the fact whether such karmas are good or bad. It means that gemstones do not have anything to do with the working nature of various planets among navagraha and they will increase good or bad events based on whether such gemstones are being worn for planets which have a large number of good karmas from the past lives attached to them or such gemstones have been worn for planets which are associated with a large number of bad karmas from past lives. Association of a planet with good karmas from past life makes it benefic for the native and accordingly the gemstone belonging to such planet becomes suitable for the native because when such gemstone speeds up the process of bringing the results of past life karmas, it brings an increased number of good results as it is materializing results for good karmas done by the native in his past life. On the other hand, association of a planet with bad karmas from past life makes it malefic for the native and accordingly, the gemstones belonging to such planet become harmful for the native because when such gemstones speed up the process of bringing the results of past life karmas to the native, they bring an increased number of bad results as they are materializing results for the bad karmas done by native during his past lives. The process of shaping up the working nature of a planet among navagraha is a very long process and it can take the sum total of all the good and bad karmas of many past lives of a native when it comes to define the working nature of a particular planet among navagraha in the present life horoscope of the native. The theory of karma and karmic astrology is very clear and Vedic astrology finds it readings and gives its recommendations based on the theory of karmas and karmic astrology which says that if a planet among navagraha is malefic in a horoscope, it simply means that the native having such malefic planet in his horoscope must have done many bad karmas in his past lives related to the significances of that planet among navagraha and accordingly, the native has to pay for his bad karmas in the form of various kinds of troubles and problems. Vedic astrology guides various natives suffering from such malefic planets that they should start doing good karmas and guided astrological remedies related to the significances of such malefic planets so that the karmic debt of such planets on the native may be reduced, which means their malefic nature may be gradually reduced and they may finally be turned into positive or benefic planets after paying all the karmic debt of such planets among navagraha. This is however a long or sometimes, a very long process and it needs continuous efforts and regular good karmas along with a great deal of patience as it can easily take many years or even the entire life of a native to change the working nature of a malefic planet. This is because, paying for karmic debt of a planet among navagraha, which was formed due to bad karmas done by the native through one or more than one of his past lives, can easily take many years of his present life or the entire present life and this is not something which can be achieved overnight, and that also without doing any good karma and merely by changing the name. For example, someone who killed a saint or many saints in his past life will have Jupiter as one of the most malefic planets in his horoscope of present life according to the theory of karmic astrology as killing a saint or killing many saints forms heavy karmic debt of Jupiter. Accordingly, Jupiter becomes malefic for the native in order to recover such karmic debt by means of afflicting most serious types of problems and troubles upon the native. Such a heavy karmic debt of Jupiter is something which can take the whole life of the native to pay by doing various kinds of good karmas and guided astrological remedies belonging to Jupiter and accordingly, such native is guided by Vedic astrology to engage in good karmas related to the significances of Jupiter. Now imagine for a second that someone can get rid of all this negativity of Jupiter and such a negative Jupiter can on the contrary be made into the most benefic planet for such native merely by changing the name and doing nothing else. The idea obviously looks very stupid and so it is, because only good karmas can balance out the sufferings inflicted upon a native as a result of karmic debt formed due to bad karmas and nothing else can do the trick. It is as simple as that and nothing can beat this theory of karmas and karmic astrology. Changing a name is not such a good karma and accordingly it can’t turn a malefic planet into a benefic planet by paying all the karmic debt owed to such planet among navagraha. Hindu mythology tells us that 3 generations of Sooryavansh had to do hard worship of lord Brahma in order to bring the holiest river Ganga on earth so that the Pitru Dosha formed by Jupiter on SooryaVansh could be rectified. It was only after the lifelong worship of king Anshuman and his son king Dilip that lord Brahma came to answer the worship of king Bhagirath, the son of king Dilip. It took 3 generations of Surya Vansh to pay the karmic debt of Jupiter which clearly tells us that paying the karmic debt of planets is a long process and it can’t be paid merely by changing the name because if it had been so, king Anshuman would have changed his name in such a way that his name number had resulted in 3 which would have made Jupiter as the most benefic planet in his horoscope and then he would have received the blessings of Jupiter despite his family having insulted and attacked a sage. According to karmic astrology, a planet can’t be benefic for a native if such planet forms karmic debt towards the native due to bad karmas done by the native in his past lives and the only way to change the malefic nature of a malefic planet is to pay the karmic debt formed by that planet. Once this karmic debt is cleared, the planet automatically stops being malefic for the native as it has now got nothing to take away from the native. However the process of building up of karmic debt of various planets among navagraha is a gradual and long process and accordingly, it takes a long time and sustained efforts to pay the karmic debt of some planet among navagraha by doing specific good karmas guided by Vedic astrology. This is not something that can be achieved overnight by merely changing a name and a name number as suggested by some astrologers or numerologists. Hence gemstones should not be worn merely on the basis of name numbers calculated from your names because many astrologers and numerologists recommending gemstones on the basis of this theory do not take the working nature of planets belonging to such gemstones, into account. It means that this theory can easily recommend gemstones for malefic planets which can cause problems or disasters for the native depending on how malefic such planets are, according to the horoscope of the native. Therefore the practice of recommending gemstones merely one the basis of names and name numbers should be avoided and gemstones recommended on the basis of this theory should not be worn as such gemstones can cause serious troubles for the native wearing them. Gemstones should only be worn for positive planets and gemstones should never be worn for malefic planets as doing so can bring up bad results and sour fruits from the past lives of the native. Therefore, the horoscope of the native should be studied thoroughly in light of Vedic astrology in order to find benefic as well as malefic planets for the native and only after that, some gemstones belonging to benefic planets in the horoscope of the native, should be recommended to the native. As the awareness about the use of gemstones has increased among people over the past 10 years or so, and as more and more people have started wearing one gemstone or the other, some people have witnessed negative effects and losses by wearing certain gemstones which were said to be suitable for them according to their astrologers but which proved harmful or very harmful for them in actual practice due to which many natives hesitate wearing any gemstones at all. For this reason, the use of gemstones is a practice which should be carried out with great care and under the supervision of an expert astrologer and gemstone specialist who knows exactly which gemstone is going to suit you according to your horoscope and what weight of that gemstone is going to suit you. However, some astrologers do not have proper knowledge on the subject and they suggest gemstones to their clients merely on the basis of certain set or preconceived theories and ideas. Most of these theories and beliefs have given birth to misconceptions in gemstone astrology and they have become the cause of problems to many natives interested in astrology and hence the practice of blindly following such theories should be avoided. In this chapter, we will discuss some facts associated with the theory of recommending gemstones on the basis of planetary Mahadasha of a native. Before moving on with the topic, let’s first get to know what a planetary Mahadasha according to Vedic astrology is and what is the significance of a planetary Mahadasha in the horoscope and life of a native. A planetary Mahadasha is called running period or planetary period in English and there is mention of many types of dashas in Vedic astrology some of which are known as Vimshottari dashas, Ashottari dashas and Yogini dashas. Sub periods of different planets called Antar dasha or Bhukti in Vedic astrology come within the mahadasha one after the other in the same cyclic pattern as mentioned above for mahadasha. with the sub period or antardasha of the lord of mahadasha starting first. It means that if Saturn mahadasha has started, the first antardasha or bhukti will be of Saturn followed by the antradasha of Mercury and so on. Similarly there are three more dashas in this system, which are called Pratayntar dasha, Sookshama dasha and Pran dasha respectively in Vedic astrology. The word Dasha simply means Period in English, where this period represents the period of time for which a dasha remains active. Vimshottari mahadasha has a five level structure where all the levels of this structure have been mentioned above, which are Mahadasha, Antradasha, Pratyantra dasha, Sookshama dasha and Pran Dasha in descending order. The smaller ones of these dashas come under the prior dashas which means that pratyantar dasha comes under antar dasha, sookshama dasha comes under pratyantar dasha and pran dasha comes under sookshama dasha. All dashas follow the similar pattern of starting first with the dasha of the planet which is in effect in the upper dasha and then following with dasha of following planets in a sequence given in the already mentioned details. The initial period of mahadasha, antardasha and other dashas influencing a person at the time of his birth is calculated according to the presence of Moon in various nakshatras and accordingly the dashas at the time of birth of a native are decided and then they follow the pattern mentioned above. Moving on with the topic, some astrologers practicing in Vedic astrology believe that wearing gemstones according to the planetary lords of running mahadashas is always suitable for all the natives and accordingly these astrologers recommend gemstones related to planetary mahadasha lords to their various clients and some of these astrologers also recommend gemstones for respective antar dasha planetary lords to their clients. For example, if a native is running under Saturn Mahadasha and Rahu Antardasha according to his horoscope, then such astrologers will recommend a Blue Sapphire and a Hessonite to such native as they believe that wearing gemstones for mahadasha lord and antardasha lord are always suitable for all natives. Some of these astrologers believe that the planetary lords of Vimshottari mahadasha and antardasha are like the king planets for the native going under such mahadasha and antardasha and wearing gemstones for such kingly planets will make the native become friends with these planets and as a result, such planets will start blessing the native with good results through their gemstones. Some of these astrologers go even further and state that if a native is not wearing the gemstones for the planetary lords of mahadasha and antradasha, it means that he is disrespecting the planetary lords or such king like planets and such planets consider this native as their enemy and hence they start giving malefic results to such native who is ignoring and insulting them by not wearing their gemstones. For these reasons, such group of astrologers will tell their clients that the first thing to do is to wear gemstones for the lords of mahadasha and antardasha according to their horoscopes so that the native may get benefic results by wearing such gemstones. However in actual practice, this theory is nothing but a misconception and the suitability of some particular gemstones for a native has got nothing to do with mahadasha or antardasha of various planets affecting that native. According to Vedic astrology, planetary mahadasha for each planet among navagraha is a time period during which the planetary lord of such Vimshottari mahadasha will be more active and stronger compared to when it is not in its mahadasha or antardasha. Hence the native is supposed to see good or bad results related to the general and specific significances of that planet depending on the strength, working nature, level of activity and interaction of that planet with other planets in his horoscope. It should be noted that mahadasha of a planet does not change the working nature of that planet and it only increases the strength and level of activity of that planet, which means that a planet which is benefic for a native and which is running in its mahadasha is likely to bring many more benefic results to the native compared to the periods when it is not running under any dasha. Similarly, a planet which is malefic for a native and which is running in its mahadasha is likely to trouble the native with more serious problems. Hence mahadasha or antardasha can only change the strength and level of activity of a planet among navagraha and they can’t change benefic or malefic nature of a planet in the birth horoscope of a native. Therefore recommending gemstones based on the planetary mahadasha or antardasha of various planets is not a good idea and the astrologers doing so should stop this practice as doing so can harm some native in the very serious ways. For example, if Saturn is malefic for a native according to his birth horoscope and a Saturn mahadasha is in effect for the native, it simply means that such negative Saturn gains more strength and it becomes more active during such mahadasha. It means that such Saturn will start troubling the native with much more intensity and quantum and recommending a Blue Sapphire in this situation is the last thing such native needs because wearing a Blue Sapphire which is the gemstone for Saturn according to Vedic astrology, will increase the strength of already negative, stronger and more active Saturn and as a result, such gemstone will start causing even more problems for the native. Hence the practice of recommending and wearing gemstones on the basis of planetary mahadasha and antardasha should be avoided as some natives may have to go through serious problems after wearing the gemstones suggested this way. Gemstones should only be worn for benefic planets and gemstones for malefic planets should not be worn by any native as doing so will increase the strength of such malefic planets and they will start causing more damages and problems for the native through their gemstones. A mahadasha is only an indicator of increased strength and increased level of activity of a planet among navagraha and it is by no means a measure of working nature of various planets among navagraha and therefore the mahadasha or antardasha of a planet among navagraha should not be made a criterion for recommending gemstones to the people as doing so can bring disastrous results if the planets ruling such gemstones are malefic in the birth horoscope of the native. Before moving ahead with the topic, let’s first get to know what are exalted planets according to Vedic astrology and when is a planet called exalted in a horoscope. We know that there are 12 zodiac signs from Aries to Pisces according to Vedic astrology and each planet among navagraha is in a state of transit in one or the other of these 12 signs. Each planet among navagraha stays in any particular zodiac sign for a specific time period and then it moves to the next sign and this process keeps going on in a cyclic way. Each planet among navagraha behaves differently when placed in different zodiac signs and the strength of each of these planets is different in different signs. Each planet among navagraha is strong or very strong in some particular sign and the same planet is weak or very weak in some particular sign. The sign in which a planet among navagraha is the strongest compared to its presence in all other signs, is called the sign of exaltation of such planet and the planet so placed in such sign is called an exalted planet. For example, Sun gains maximum strength when it is placed in the sign of Aries and accordingly, Aries is called the sign of exaltation of Sun and Sun is called exalted when it is placed in the sign of Aries in a horoscope. Similarly all other planets among navagraha are exalted in different signs and Vedic astrology mentions the signs of exaltation of all planets among navagraha. Moving on, some astrologers believe that when a planet is exalted in a horoscope, it automatically becomes positive in nature and it gives benefic results for the native and hence wearing gemstones for such planet can give good or very good results to the native. Hence such astrologers recommend wearing gemstones which belong to the exalted planets in a horoscope as they think that wearing gemstones for exalted planets is always suitable for a native. These astrologers state that putting on gemstones for exalted planets can never cause harm as such exalted planets are called Uchcha Grahas in Hindi, which translates into a positive term and accordingly such planets are always positive or benefic for the native and hence every native can safely wear gemstones for exalted planets. However, in actual practice, exaltation is merely a measure of strength of a planet and this attribute of exaltation should not be used for deciding the working nature of a planet as doing so can cause serious problems for the native having some exalted planets in his horoscope if he is recommended to wear gemstones for such exalted planets. We will discuss this fact with the help of an example now. Recently, Saturn has transited through Libra and Saturn is considered exalted according to Vedic astrology, when it is placed in the sign of Libra. Now, according to the above mentioned theory of recommending gemstones on the basis of exalted planets, Saturn should be benefic for all the natives born during this period of time and all the natives born during the transit of Saturn in Libra can witness benefits by wearing various gemstones for Saturn. We know that according to Vedic astrology, Saturn stays in a sign for an approximate time of 2 years and 6 months. It means that all the natives born during this period of 2 years and 6 months will have exalted Saturn in their horoscopes and accordingly all of them can wear gemstone for Saturn as Saturn is benefic in their horoscopes by virtue of being exalted. It further means that hundreds of millions of people born during these 2.5 years will be blessed by a benefic Saturn and it also means that a planet (Saturn in this case) can continuously remain benefic for a period as long as 2 years and 6 months. This is logically and practically not possible as each planet among navagraha keeps changing its working nature continuously and it can change its nature completely from benefic to malefic or from malefic to benefic in a matter of 30 minutes or so and hence a planet can’t remain benefic for a continuous period of 2.5 years. It should also be noted that during the placement of Saturn in Libra, many natives will be born under the influence of malefic Sade Sati of Saturn and accordingly these natives will face many problems due to such Sade Sati. Wearing gemstone for Saturn will further increase their problems as wearing such gemstone will increase the strength of malefic Sade Sati of Saturn in their horoscopes which in terms will increase their problems. Sade Sati of Saturn is said to be effective in a horoscope when Saturn is placed with Moon in a horoscope. Since Saturn remains present in a sign for 2.5 years and Moon remains present in a sign for 2.5 days. Every month, Moon stays in the sign of placement of Saturn which is Libra in this case, for 2.5 days. Hence every 12th person born during these 2.5 years will have Sade Sati in his horoscope as Moon completes its round of twelve signs in a month and accordingly, the chances of Moon being present with Saturn in Libra are in one 1 out of twelve horoscopes. It is important to note that Sade Sati of Saturn can’t give malefic results to a native if Saturn is benefic in his horoscope and therefore Saturn has to be malefic in the horoscope in order to make the native suffer from Sade Sati. Similarly there are other malefic defects associated with Saturn like Dhaiyaa of Saturn and various other defects like Pitru Dosha formed by Saturn. As Saturn becomes malefic and forms any of these defects in various horoscopes, the natives suffering from such defects should never wear gemstones for Saturn as wearing such gemstones will intensify their sufferings by adding more strength to such defects. Considering the case of some other planets among navagraha, there are planets like Jupiter, Rahu and Ketu which remain present in a particular sign for a period of 1 year or more and subjecting these planets to the above mentioned theory will again mean that these planets will continue to be benefic for all the natives born during their presence in their signs of exaltation. Accordingly, all these natives can benefit by wearing gemstones for such planets which is again far away from the truth and hence this theory of believing that exalted planets are always benefic and gemstones should be worn for exalted planets is nothing but another misconception among various misconceptions found in Gemstones Astrology. It is interesting and important to note here that the gemstones for Saturn, Rahu and Ketu are suitable only for a limited number of people as each one of these 3 planets among navagraha is rarely seen cleanly positive or benefic in a horoscope and accordingly their corresponding gemstones are suitable for a very limited number of people. In my practice of Vedic astrology which includes the analysis of more than 60,000 horoscopes now, I have found that various gemstones belonging to Saturn are found suitable only for every 2 to 4 natives among 100 natives on average and the gemstones for Rahu and Ketu are found suitable for the similar number of natives on average which indicates that these planets rarely behave as completely benefic or completely positive in a horoscope. Therefore the gemstones associated with these planets should be worn with utmost care as the gemstones belonging to these 3 planets are not suitable for most people and many of my clients have told me that they have faced serious problems after wearing gemstones for 1 or more than 1 out of these 3 planets on the basis of recommendations of various astrologers. In many of such cases, such gemstones were recommended merely on the basis that the planets corresponding to these gemstones were exalted in the horoscopes of such natives, which was considered as a sufficient reason for recommending such gemstones. The results were troublesome and even disastrous for some natives and some of these natives got afflicted with serious diseases like tumors or some serious psychological problems. Hence the practice of recommending gemstones for exalted planets should be avoided. An exalted planet can be benefic as well as malefic in a horoscope and in case, an exalted planet becomes malefic in a horoscope, it already becomes one of the most problematic planets in the horoscope due to the fact that it is malefic and at the same time, it is very strong. If such is the case, the last thing a native wants to do is to provide extra strength to such already very strong and malefic planet in his horoscope as such exalted but negative planets will start troubling this native with even more strength. Gemstones should only be worn for benefic planets and they should not be worn for malefic planets as gemstones are only capable of providing strength to their corresponding planets among navagraha and they can’t change the working nature of planets. It means that wearing gemstones for malefic planets will increase the strength of such malefic planets and these planets will cause even more problems and troubles for the native. Therefore, gemstones should only be worn for positive planets so that such positive planets may gain extra strength and the native may witness more benefits from such positive planets. Vedic astrology provides various guidelines to decide the benefic or malefic nature of various planets among navagraha and an astrologer should carefully analyze every horoscope in order to find the benefic planets from the horoscope and only then he should recommend gemstones for such benefic planets. Vedic astrology recommends 9 gemstones, one for each planet among navagraha. These nine gemstones are called Ruby, Pearl, Yellow Sapphire, White Sapphire or Diamond, Red Coral, Emerald, Blue Sapphire, Hessonite and Cat’s Eye, and they are worn for Sun, Moon, Jupiter, Venus, Mars, Mercury, Saturn, Rahu and Ketu respectively. Through this series of articles we will look at certain characteristics possessed by each one of these gemstones and in the present article, we will discuss some important things about Yellow Sapphire, which is the gemstone associated with Jupiter. Jupiter as we know is an important planet in each horoscope and the nature as well as the strength of Jupiter can vary from horoscope to horoscope, which means that in some horoscopes, Jupiter may be very strong, it may be having average strength in some horoscopes and it may be weak or very weak in some other horoscopes. The strength of Jupiter is measured by various methods available in Vedic astrology though some astrologers and people interested in astrology still think that the presence of Jupiter in a particular sign is the only factor that can affect the strength of Jupiter in a horoscope. This is not true as there are many factors which can affect the strength or weakness of Jupiter in a horoscope and the placement of Jupiter in a particular sign is just one of them. Moving ahead, sometimes Jupiter can become weak in a horoscope due to its placement in its sign of debilitation, due to affliction from one or more than one malefic planets in the horoscope, due to weak placement in some specific houses of the horoscope and various other factors. When Jupiter becomes weak in a horoscope, it is not fully capable of protecting its general as well as specific significances and hence the native may see bad results or fewer good results related to the significances of Jupiter. If such weak Jupiter is working as a benefic planet in a horoscope, some extra strength must be provided to such weak Jupiter so that it may start working properly in the horoscope and it may protect its significances. This results in good things happening to the native in various spheres of his life. This extra strength is provided with the help of a specific gemstone called Yellow Sapphire which transfers the energy of Jupiter from the planet itself into the body of the native who wears this gemstone. Yellow Sapphire is called Guru Ratna or Pushparaag in Sanskrit, Peela Pukhraaj or Pukhraj in Hindi. This gemstone captures the energy of Jupiter from its upper surface and it transfers this energy into the body of the native who wears it. The additional energy of Jupiter transferred by Yellow Sapphire into the body of the native provides extra strength to Jupiter and it starts working in a stronger way in the horoscope, body as well as the Aura of the native. It should be noted that a Yellow Sapphire is only capable of increasing the strength of Jupiter inside the body and Aura of a native by transferring additional energy of Jupiter and this gemstone is not capable of changing the working nature of Jupiter in a horoscope. It means that if Jupiter is working positively or Jupiter is benefic in a horoscope, wearing this gemstone will increase the strength of Jupiter and as such positive Jupiter gains strength, it will start producing good results for the native with increased quantum and frequency. On the other hand, if Jupiter is working negatively which means that Jupiter is malefic in the horoscope, wearing the gemstone for Jupiter will provide additional strength to this negative Jupiter and as it gains strength, it will start causing problems and losses for the native with increased strength and quantum. Hence, utmost care should be taken that only those people should wear this gemstone, who have a benefic Jupiter in their horoscopes whereas the natives having a malefic Jupiter in their horoscopes should not wear a Yellow Sapphire as wearing this gemstone can cause serious problems related to many spheres of their lives. Looking at the composition of this gemstone, Yellow Sapphire belongs to the family of corundum which is a type of family of gemstones and this gemstone is found available in different colors and shades of Yellow ranging from light Yellow, medium dark Yellow to dark Yellow. The color and clarity of this gemstone are 2 important aspects to look for when purchasing a Yellow Sapphire though color and clarity are not the only aspects which decide the quality of this gemstone and there are many other aspects which can affect the final quality and efficiency of this gemstone. Hence it is very difficult for a common man to test or check the exact quality of a Yellow Sapphire but even then, making a check for proper color and proper clarity can still make a difference in the kind of gemstone you are going to purchase. It should be noted that different colors of Yellow Sapphire may be suitable for different natives and hence every native should wear a Yellow Sapphire belonging to a color which has been recommended by his astrologer. Changing the color of this gemstone against the recommendation of your astrologer can result in some side effects which may keep bothering you along with the benefits, though the change in color of this gemstone, alone is not likely to make this gemstone produce all negative effects for you, if Jupiter if benefic in your horoscope. Hence due attention should be paid to the color of your Yellow Sapphire when purchasing this gemstone. Due attention should also be paid to the weight of this gemstone recommended by your astrologer and it is strongly advised to wear a Yellow Sapphire which falls within the weight range recommended by your astrologer as changing the weight of this gemstone with your own discretion or on the advice of your jeweler can bring unwanted and unwelcome results for you. For example, wearing a Yellow Sapphire much less in weight than the weight of this gemstone recommended by your astrologer may not bring significant good results or any results at all whereas wearing a Yellow Sapphire which is much higher in weight compared to the weight of this gemstone, recommended by your astrologer can cause mild or serious side effects. In some extreme cases, it can also produce negative effects due to the native not being able to handle so much extra energy of Jupiter, which has been transferred into his body through this gemstone. Hence due attention should be paid to the weight of Yellow Sapphire recommended by your astrologer when purchasing this gemstone. Vedic astrology recommends practicing some procedures before wearing a Yellow Sapphire which may include the steps like purification and energization of this gemstone. Purification of a Yellow Sapphire is the process through which any negative energy attached to this gemstone is removed with the help of Mantras and some specific Vedic procedures whereas energization of a Yellow Sapphire is the process through which this gemstone is charged with the help of Mantras and some specific Vedic procedures so that it may produce its optimum results. The processes of purification and energization of a Yellow Sapphire are technical processes and they should be conducted only by expert pandits who know the proper procedures to carry out these processes. Once the native has got his duly purified and energized Yellow Sapphire fitted in a ring or in a pendant, the next step is to wear this gemstone, which also involves some specific procedures. Vedic astrology recommends that a Yellow Sapphire should be worn on a Thursday morning when the native is wearing this gemstone for the first time in his life. Before wearing a Yellow Sapphire on a Thursday morning, the native should put this gemstone in GangaJal (water of Holy River Ganga) or in a mixture of unboiled milk and pure water about 8 to 12 hours before the time of wearing this gemstone, which comes out to be Wednesday evening in most cases as this gemstone is recommended to be worn on a Thursday morning. The native should take his bath on Thursday morning, say his prayers and then he should sit or stand in front of the ring or pendant and he should first chant Mool Mantra or Beej mantra of Jupiter for 108 times or 27 times and then he should pray to god Jupiter and ask him to provide best possible results from this gemstone. After doing so, the native should take the Yellow Sapphire ring or Pendant, he should rinse it with clean water in case he had put it in a mixture of unboiled milk and water, then he should wipe it with a clean cloth and after completing all these procedures, the native should wear his Yellow Sapphire ring. Wearing a Yellow Sapphire with proper procedures recommended by Vedic astrology can bless the native with many good and very good things which come under the general as well as the specific significances of Jupiter, according to the horoscope of the native. Therefore all natives are advised to wear this gemstone with proper procedure in order to get maximum benefits from this gemstone. After initially wearing this gemstone, the native should regularly clean his Yellow Sapphire in order to keep getting optimum results from this gemstone. A good frequency to clean a Yellow Sapphire is once every 3 to 6 months depending on the nature of job of the native and depending on how fast this gemstone accrues greasy deposits of oil and dust on its surfaces. Not cleaning your Yellow Sapphire for a long period of time can result in big deposits on the surface of this gemstone, particularly on the lower surface of this gemstone. Such deposits can temper with the working of your Yellow Sapphire in a negative way by blocking the energy radiations of Jupiter which are supposed to be transferred into your body through this gemstone. Hence all the natives wearing a Yellow Sapphire should regularly clean it in order to keep getting optimum benefits from this gemstone. Vedic astrology recommends 9 gemstones, one for each planet among navagraha. These nine gemstones are called Ruby, Pearl, Yellow Sapphire, White Sapphire or Diamond, Red Coral, Emerald, Blue Sapphire, Hessonite and Cat’s Eye, and they are worn for Sun, Moon, Jupiter, Venus, Mars, Mercury, Saturn, Rahu and Ketu respectively. Through this series of articles we will look at certain characteristics possessed by each one of these gemstones and in the present article, we will discuss some important things about White Sapphire, which is the gemstone associated with Venus. Venus as we know is an important planet in each horoscope and the nature as well as the strength of Venus can vary from horoscope to horoscope, which means that in some horoscopes, Venus may be very strong, it may be having average strength in some horoscopes and it may be weak or very weak in some other horoscopes. The strength of Venus is measured by various methods available in Vedic astrology though some astrologers and people interested in astrology still think that the presence of Venus in a particular sign is the only factor that can affect the strength of Venus in a horoscope. This is not true as there are many factors which can affect the strength or weakness of Venus in a horoscope and the placement of Venus in a particular sign is just one of them. Moving ahead, sometimes Venus can become weak in a horoscope due to its placement in its sign of debilitation, due to affliction from one or more than one malefic planets in the horoscope, due to weak placement in some specific houses of the horoscope and various other factors. When Venus becomes weak in a horoscope, it is not fully capable of protecting its general as well as specific significances and hence the native may see bad results or fewer good results related to the significances of Venus. If such weak Venus is working as a benefic planet in a horoscope, some extra strength must be provided to such weak Venus so that it may start working properly in the horoscope and it may protect its significances. This results in good things happening to the native in various spheres of his life. This extra strength is provided with the help of a specific gemstone called White Sapphire which transfers the energy of Venus from the planet itself into the body of the native who wears this gemstone. Diamond is called Heerak in Sanskrit, Heera in Hindi whereas White Sapphire is called Shwet Pukhraaj or Safed Pukhraaj. Though both Diamond and White Sapphire are recommended for Venus and though many astrologers prefer Diamond over White Sapphire, White Sapphire is a better option for Venus in most cases. This is due to the reason that not all the Diamonds belong to Venus on isolate basis, which means that many Diamonds may transfer the energy of some other planets also, along with the energy of Venus, into the body of the wearer. Apart from this, the energy radiations transferred by Diamond are sometimes more intense than a native can handle as Diamond has a tendency to intensify the originally captured energy radiations of Venus, before transferring such energy radiations into the body of the wearer. The above mentioned two aspects make Diamond a difficult choice for most natives and hence White Sapphire should be worn as the gemstone of Venus as a White Sapphire does not produce any of the side effects mentioned above. This gemstone captures the energy of Venus from its upper surface and it transfers this energy into the body of the native who wears it. The additional energy of Venus transferred by White Sapphire into the body of the native provides extra strength to Venus and it starts working in a stronger way in the horoscope, body as well as the Aura of the native. It should be noted that a White Sapphire is only capable of increasing the strength of Venus inside the body and Aura of a native by transferring additional energy of Venus and this gemstone is not capable of changing the working nature of Venus in a horoscope. It means that if Venus is working positively or Venus is benefic in a horoscope, wearing this gemstone will increase the strength of Venus and as such positive Venus gains strength, it will start producing good results for the native with increased quantum and frequency. On the other hand, if Venus is working negatively which means that Venus is malefic in the horoscope, wearing the gemstone for Venus will provide additional strength to this negative Venus and as it gains strength, it will start causing problems and losses for the native with increased strength and quantum. Hence, utmost care should be taken that only those people should wear this gemstone, who have a benefic Venus in their horoscopes whereas the natives having a malefic Venus in their horoscopes should not wear a White Sapphire as wearing this gemstone can cause serious problems related to many spheres of their lives. Looking at the composition of this gemstone, White Sapphire belongs to the family of corundum which is a type of family of gemstones and this gemstone should be absolutely colorless in order to be a White Sapphire as the addition of even a hint of any other color will change this gemstone from White Sapphire to some other sapphire. For example, a little hint of yellow in this gemstone will make it a light colored Yellow Sapphire which is a gemstone for Jupiter and not a gemstone for Venus. The color and clarity of this gemstone are 2 important aspects to look for when purchasing a White Sapphire though color and clarity are not the only aspects which decide the quality of this gemstone and there are many other aspects which can affect the final quality and efficiency of this gemstone. Hence it is very difficult for a common man to test or check the exact quality of a White Sapphire but even then, making a check for proper color and proper clarity can still make a difference in the kind of gemstone you are going to purchase. It should be noted that different colors of White Sapphire may be suitable for different natives and hence every native should wear a White Sapphire belonging to a color which has been recommended by his astrologer. Changing the color of this gemstone against the recommendation of your astrologer can result in some side effects which may keep bothering you along with the benefits, though the change in color of this gemstone, alone is not likely to make this gemstone produce all negative effects for you, if Venus if benefic in your horoscope. Hence due attention should be paid to the color of your White Sapphire when purchasing this gemstone. Due attention should also be paid to the weight of this gemstone recommended by your astrologer and it is strongly advised to wear a White Sapphire which falls within the weight range recommended by your astrologer as changing the weight of this gemstone with your own discretion or on the advice of your jeweler can bring unwanted and unwelcome results for you. For example, wearing a White Sapphire much less in weight than the weight of this gemstone recommended by your astrologer may not bring significant good results or any results at all whereas wearing a White Sapphire which is much higher in weight compared to the weight of this gemstone, recommended by your astrologer can cause mild or serious side effects. In some extreme cases, it can also produce negative effects due to the native not being able to handle so much extra energy of Venus, which has been transferred into his body through this gemstone. Hence due attention should be paid to the weight of White Sapphire recommended by your astrologer when purchasing this gemstone. Vedic astrology recommends practicing some procedures before wearing a White Sapphire which may include the steps like purification and energization of this gemstone. Purification of a White Sapphire is the process through which any negative energy attached to this gemstone is removed with the help of Mantras and some specific Vedic procedures whereas energization of a White Sapphire is the process through which this gemstone is charged with the help of Mantras and some specific Vedic procedures so that it may produce its optimum results. The processes of purification and energization of a White Sapphire are technical processes and they should be conducted only by expert pandits who know the proper procedures to carry out these processes. Once the native has got his duly purified and energized White Sapphire fitted in a ring or in a pendant, the next step is to wear this gemstone, which also involves some specific procedures. Vedic astrology recommends that a White Sapphire should be worn on a Friday morning when the native is wearing this gemstone for the first time in his life. Before wearing a White Sapphire on a Friday morning, the native should put this gemstone in GangaJal (water of Holy River Ganga) or in a mixture of unboiled milk and pure water about 8 to 12 hours before the time of wearing this gemstone, which comes out to be Thursday evening in most cases as this gemstone is recommended to be worn on a Friday morning. The native should take his bath on Friday morning, say his prayers and then he should sit or stand in front of the ring or pendant and he should first chant Mool Mantra or Beej mantra of Venus for 108 times or 27 times and then he should pray to god Venus and ask him to provide best possible results from this gemstone. After doing so, the native should take the White Sapphire ring or Pendant, he should rinse it with clean water in case he had put it in a mixture of unboiled milk and water, then he should wipe it with a clean cloth and after completing all these procedures, the native should wear his White Sapphire ring. Wearing a White Sapphire with proper procedures recommended by Vedic astrology can bless the native with many good and very good things which come under the general as well as the specific significances of Venus, according to the horoscope of the native. Therefore all natives are advised to wear this gemstone with proper procedure in order to get maximum benefits from this gemstone. After initially wearing this gemstone, the native should regularly clean his White Sapphire in order to keep getting optimum results from this gemstone. A good frequency to clean a White Sapphire is once every 3 to 6 months depending on the nature of job of the native and depending on how fast this gemstone accrues greasy deposits of oil and dust on its surfaces. Not cleaning your White Sapphire for a long period of time can result in big deposits on the surface of this gemstone, particularly on the lower surface of this gemstone. Such deposits can temper with the working of your White Sapphire in a negative way by blocking the energy radiations of Venus which are supposed to be transferred into your body through this gemstone. Hence all the natives wearing a White Sapphire should regularly clean it in order to keep getting optimum benefits from this gemstone.